To purchase or for more information please email theoutdoorist@hotmail.co.uk. Prices include second class postage. I am going to run a give away through November for a brand new Ribz gear vest after my review back in May. To enter the competition I would like a post about your personal day kit and an overnight kit. Entries can be on blogs or YouTube just put a link to this post and email me a link to your entry. This will count as two entries. Also for anyone who does not have a blog or YouTube account you can email me entries at theoutdoorist@hotmail.co.uk with entries which will count as one entry. Just to inform I am still around, broke my wrist in August and still in a cast so not getting out much but as soon as possible I will be back out and posting. Will try to get some posts up soon. 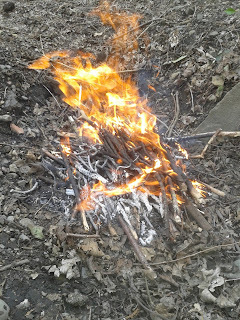 I carried the Emberlit stove as I did not want an open fire and used a cotton ball, birch bark and maya stick to light. 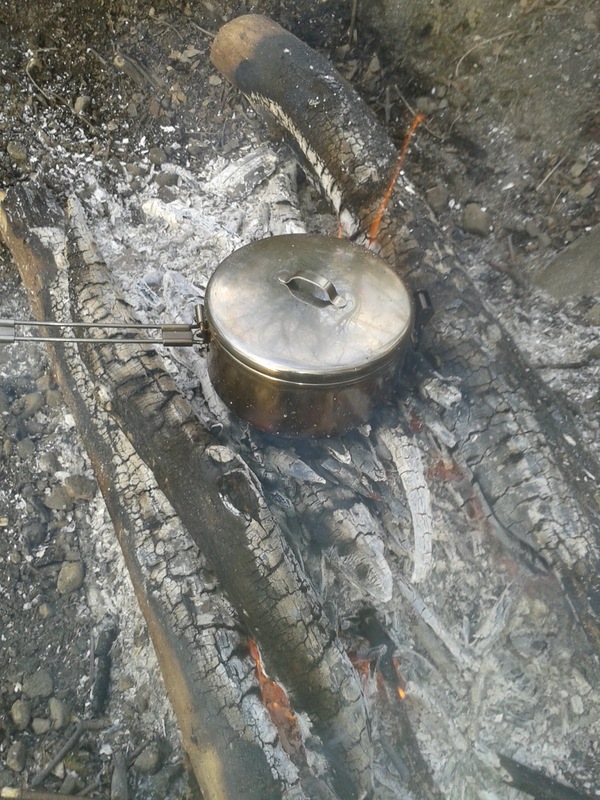 I use long sticks with the Emberlit stove so it can be kept burning by pushing the sticks into the stove. 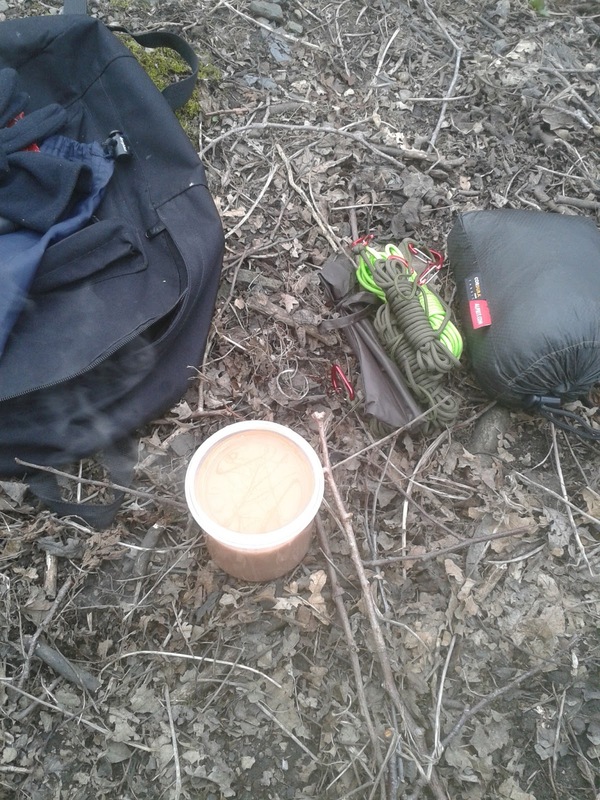 I boiled milk in the Pathfinder cup and made porridge. Set up the hammock and although the tarp was carried it was not used. I use a simple set up for the hammock of two tree straps and whoopie slings on the tarp. Boiled up some more milk to make hot chocolate. Recently I was offered the chance to try out Ribz. After trying Ribz I can say they are great! The Ribz system can be used as a day kit alone or used for essential items on an overnight camp so when you arrive at camp you can drop your pack and wander off and still have all the essentials to hand which I found excellent. The Ribz system is really well designed and what I really liked is the accessibility to everything as you are on the move even if you are carrying a rucksack with the system. Also on a day hike I was virtually wearing all my kit so the weight was very well distributed making very comfortable walking throughout the day. Pathfinder bottle and cup with stove ring carried easily in the pouch. First aid kit is always close to hand using the Ribz. 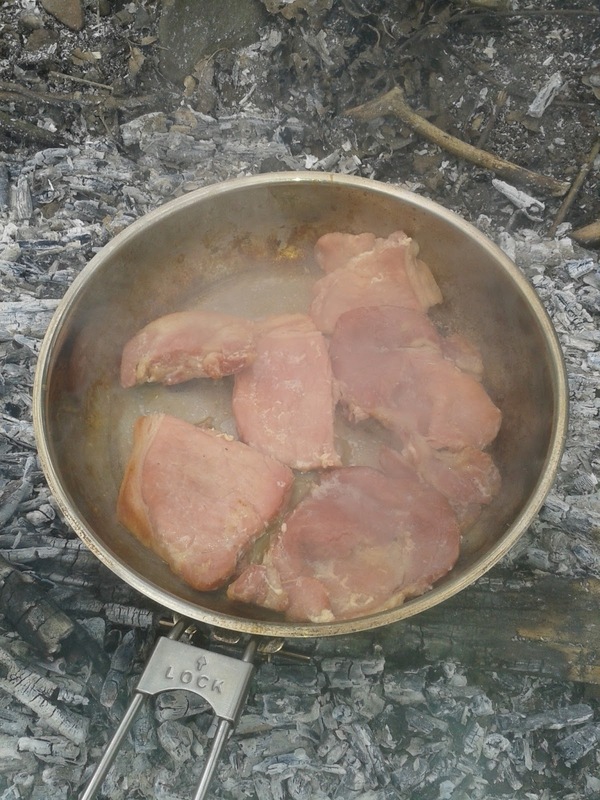 Here are the Ribz being used with a rucksack, can still wear the hip belt with ease. Tools and fire lighting kit in the other pouch. Great items to have to hand. Having your tools to hand is great and with the Ribz you do not have to have them on display. Another great thing about the Ribz is having your first aid kit to hand which I think is essential when in the outdoors and especially when using sharp tools. 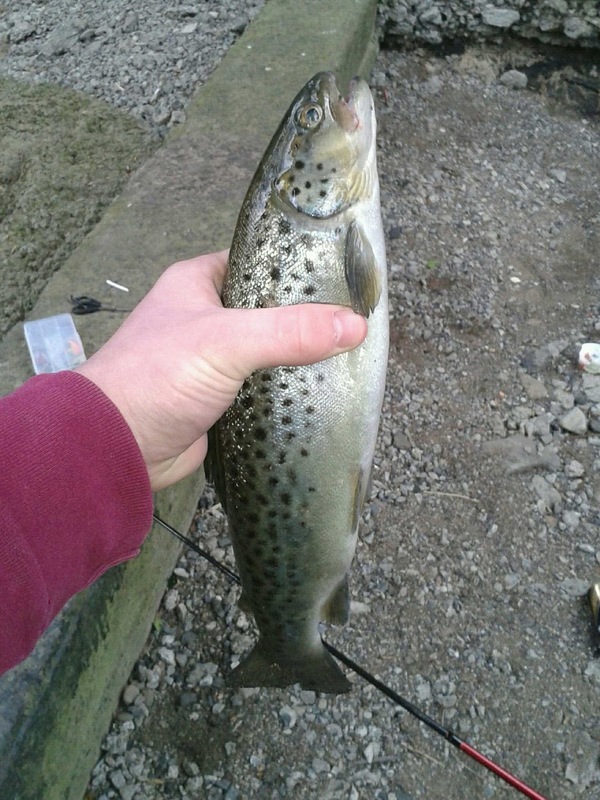 I also used the Ribz system when fishing which I found great as I had everything on hand for a change so was not stuck looking through my pack for scissors or something else that I can never normally find. I have very kindly been given a promotional code for the Ribz which will give a 50% discount to my readers which will reduce the Ribz to just $29.95, shipping to Europe I believe is usually $25 so using the code will not only gain you free shipping but also save a few pounds. Found Ribz a great company to deal with and the customer service is excellent. 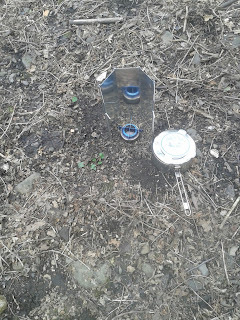 This is a very simple set up which works excellently because the billy can be moved so easily and you can higher and lower the pot very easily which is great for boiling water or simmering rice and many other things. Spend the day in the woods today so here are a few pictures from the day. There are a lot of bluebells coming through at the moment which is very nice to see. Carved some tent pegs using my knife made by Mark Hill. Hammock and tarp set up. There was no rain through the day but I put the tarp up as there was a strong wind which the tarp stopped perfectly. 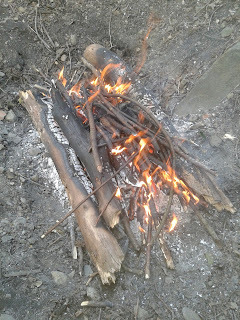 Fire was lit with the firesteel using birch bark and some fatwood. 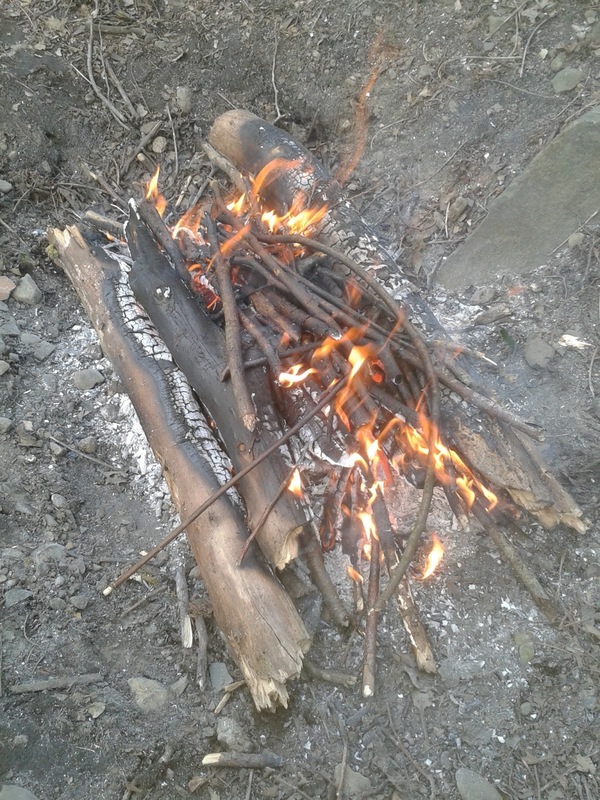 My fire is held in a oilskin pouch and contains fatwood and birchbark and also holds my firesteel. My cook kit is the Pathfinder bottle and cup. 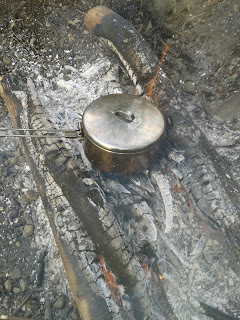 I also carry the stove ring even when cooking on the fire as the cup cannot be suspended over the fire so I rest it on the stove ring to prevent the fire and coals from being smothered. 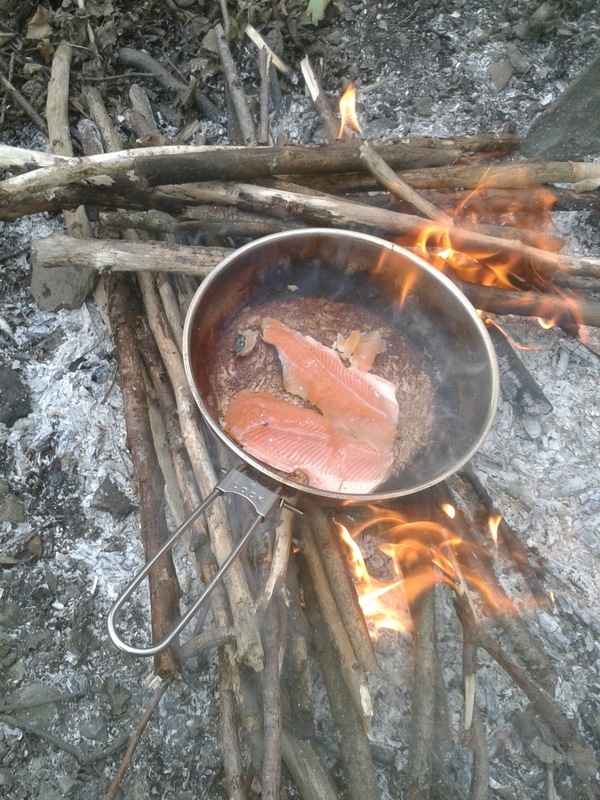 Planned a day out fishing but I packed the hammock and tarp, a stove and some pans as I knew we would be near some great woods. 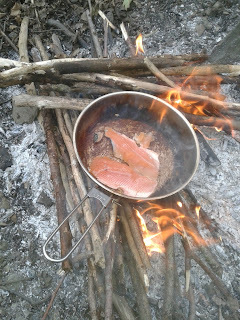 After a good days fishing I headed to the woods and made fire to cook a fish I had caught. Let the fire burn for a little while before packing up and heading home! 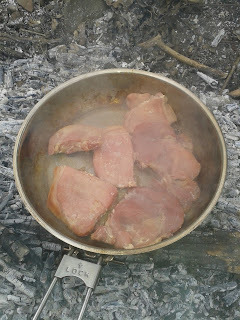 I did not make fire or take a stove and I had the tarp and hammock with me but they were not used today. The Outdoorist. Awesome Inc. theme. Powered by Blogger.